Yes, it collapsed! The IKEA flatpack gingerbread house. As predicted by Mr Gloom aka the construction engineer aka husband. It was more than a roof collapse. It was a DEMOLITION! I am devastated! I blame the design flaws and the weather. Equally. Both issues were covered in some detail in the previous post. At this stage I am too shattered to think clearly. Recurrence of PTSD after an initial trauma results in less ‘elasticity’ for the individual to recover to normal function. Should there be multiple such traumas, recovery ability plummets to depths unexplored. Having now suffered two such gingerbread house PTSD episodes, I am not at all willing to subject myself to more. Ever. At present my emotional state is teeter-tottering through the various stages of profound early grief as so ably researched and published in the works of Dr Elizabeth Kübler-Ross. Anger, disbelief, outrage, severe anguish… I am nowhere near the resolution and recovery phase. My hope is that by Christmas I will have recovered sufficiently to put on a brave public face. Excuse me – I cannot write any more just now, I am too distraught. 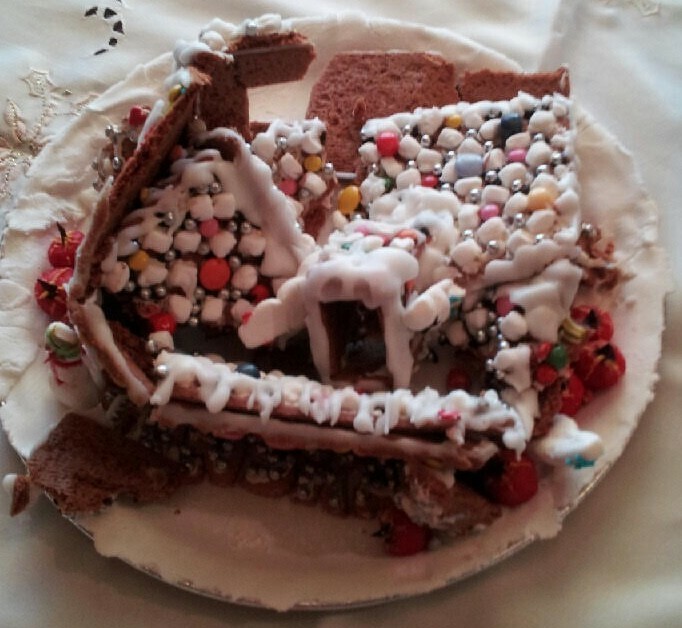 The image of a collapsed gingerbread house is etched too vividly in my mind. (sobbing, rush out of room and lock self in bathroom). PS – the above was written yesterday in an attempt to begin working towards closure. The multiple PS’s are written after a good night’s sleep. You may notice a change in tone. PPS – going to see the latest release Star Wars movie last night with family proved to be an enjoyable distraction from the day’s events. It was a late viewing so we did not get to bed till well after midnight. I slept peacefully. Yesterday’s 42.9C was the earliest hottest day of December on record. Pt Augusta, a couple hundred kilometres north of Adelaide had a temperature of 45.2C. PPPPS – note to self: I am more resilient than I gave myself credit for (smiling with relief)! I am well on the way to my normal default setting of optimism. However, I have not changed my mind about revisiting gingerbread house assembly. That may never happen. Hahaha, you get over it Raili the best revenge on the gingerbread house is to eat it! Doing that! The revenge is sweet …. So sorry for your loss! Hope it’s afterlife is sweeter! Hmm, perhaps I didn’t give enough credence to that cause. You may be onto something there ! I’m still learning from you, as I’m making my way to the top as well. I definitely enjoy reading all that is written on your website.Keep the articles coming. I loved it! Glad you loved the read 🙂 There will definitely be more. As a site possessor I believe the content matter here is rattling fantastic , appreciate it for your hard work. You should keep it up forever! Best of luck. I’m still learning from you, as I’m improving myself. I definitely love reading all that is posted on your blog.Keep the articles coming. I enjoyed it!